The Vatican Museum is one of the most important and largest museums in the world and one of the absolute top sights in Rome. Of course, it is not really in Rome, but on the territory of the independent state Vatican, in the middle of the city of Rome. The distance of the Vatican from the city centre of Rome is approximately two kilometres. Most visitors take the subway to the Vatican Museum. You can see a gigantic collection of historical objects and works of art from antiquity to the present. The highlight for many visitors to the museum is the Sistine Chapel in the Vatican, which can only be seen during a visit to the museum. A new Pope is elected in the Sistine Chapel. The Sistine Chapel contains some of the most famous works of art in the world. These include, without doubt, some of Michelangelo’s works such as the „Last Judgement“ behind the altar and some of the ceiling paintings such as „Expulsion from Paradise“. In the museum itself there is a gigantic exhibition area. It is almost impossible to see all the rooms in one day. Even if you only want to see the most important things, it takes several hours. In our opinion, you should definitely see the so-called Raphael Rooms, four rooms painted by the artist Raffael at the beginning of the 16th century. Unfortunately, the Vatican Gardens can only be visited to a small extent, unless you book an tour. In the Vatican Museum, you can theoretically buy an entrance ticket at the box office, but you usually have to queue for hours. Often, the queue along the wall around the Vatican is several hundred metres long, often even one kilometre and more. A lot of museum visitors meanwhile have tickets with preferential admission (without queuing). These are available in advance on the Internet. A combination ticket for the Vatican with a museum and St. Peter’s Cathedral is also very popular. St. Peter’s Basilica is theoretically free, but there are also very long queues. We even waited 2 hours in December. 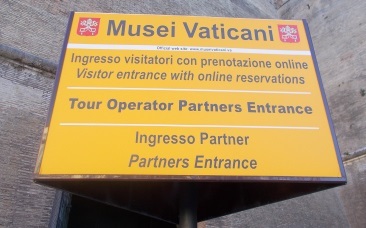 The entrance to the Museum cannot be reached from the Vatican (Piazza San Pietro and the Church of St. Peter). 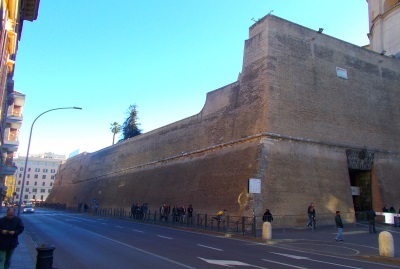 If you are already there, you have to leave the Vatican and walk along the high wall that surrounds the Vatican. After about 10 minutes you reach the entrance of the museum. There are two entrances, one is only for groups who have booked online. If you choose the other entrance (main entrance), you almost always have to wait in a long queue. A check follows like at the airport. Caution: You cannot visit the Vatican Museum with short trousers, mini-skirt or uncovered shoulders. Like in the airplane, any kind of objects that could be used as weapons are forbidden. This includes, for example, glass bottles, scissors, pocket knives. These rules are strictly observed. After the check, you can hand over things to a wardrobe that you do not need in the Vatican Museum (rucksack, bag, jacket, etc.). If possible, it is best not to take any bags with you at all, as the wardrobe could lead to waiting times again. Not only at the entrance, but also in many rooms of the Vatican Museum the crowd is enormous. Also the many guided groups annoy many other visitors because they are loud and block the ways through the museum. It is a good idea to come very early (opening hours see below) and preferably on a weekday. But even then there is a lot going on. The Sistine Chapel is the busiest. Walking through the Vatican Museum: Through the main buildings there is a fixed tour in one direction. If you come during rush hours, you can also visit the exhibitions to the right of the entrance first. Especially in the morning, there is little going on here, as almost all museum visitors walk the main route first. For example, the world-famous Pinakothek, the exhibition of the coins and stamps of the Vatican and great the carriage museum in the cellar are not on the main route. In the carriage museum you can also see the cars and popemobiles of the popes of the last century. As for most of the visitors, our highlight was the grandiose paintings of Michelangelo in the Sistine Chapel. The second absolute highlight are the four rooms by Raffael. We especially liked the painting „School of Athens“. But we also found the estimated more than 100 meter long room with the gallery of maps and the Pope’s cars in the carriage museum absolutely great. Here is also the Papamobil, in which Pope John Paul II was at the attempted attack in Rome in 1981. Also the spectacular snail staircase at the exit will remain in our memory for a long time. But most of all we were surprised by the gigantic dimensions. According to a literature source, you should have to walk almost 15 kilometres in the Vatican Museum to see everything. It is the biggest museum in the world. Tickets should be purchased in advance: The queue is often incredibly long, even in low season. 2 hours and more waiting time for buying tickets at the museum are not uncommon. Important: It is absolutely necessary to buy the entrance tickets to the Vatican Museum in advance on the internet. Those who already have a printed ticket or an admission ticket on their smartphone do not have to queue. You can get in at the entrance without waiting time if you book a ticket without queuing or a guided tour on the Internet..
Prices Museum Vatican: The entrance fee on site is 16 Euro, with advance booking on the Internet several Euro more. If you are not lucky enough to come on a quiet weekday in January, you should pay the entrance fee in advance on the internet. We ourselves waited a little more than an hour on a Monday morning at the end of November 2018. (Information and prices are from the beginning of 2019). Free admission to the Vatican Museum: On the last Sunday of the month, unless it is a public holiday, the museum is open for a few hours and admission to the museum is free! But then there is even more going on than on other days. In November 2018 we wanted to visit the Vatican Museum on the last Sunday for free. The queue was more than one kilometre long when we arrived at 10 o’clock in the morning. After we didn’t make 100 meters in half an hour, we gave up. During the season the queue should be even longer. Opening hours Vatican Museum: Every day except Sunday from 9 to 18. The museum is also open on the last Sunday of the month (free entry!, opening hours only until 2 p.m., but enormous waiting times at the entrance, see above Free entry). On most holidays in Italy and some other days the Vatican Museum is closed. This applies for example to New Year, Epiphany (6th Jan), Assumption, Sacrosanct, Conception, Easter and Christmas. Food and drink: In the Musei Vaticani there are several snack bars, cafes and restaurants. The prices are quite low. We paid only 1.30 Euros for 0.5 litres of mineral water in 2018, 5 Euros for a larger piece of pizza with a drink of your choice and 1 Euro for coffee. In many museums in Italy we have already seen prices far more than double for food and drinks. In addition, there are also inexpensive vending machines. Shops in the Vatican Museum: There are several shops offering books about the Vatican Museum, travel guides about Rome, etc. Besides there are souvenirs, postcards, a post office with the popular stamps of the Vatican and of course also souvenirs and much more. WC Vatican Museum: The free toilets were ok and clean during our visit. There are several toilets in the different sections of the museum. 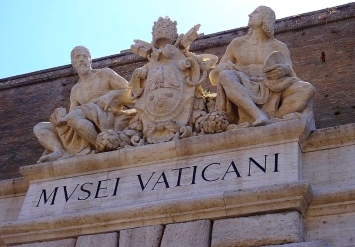 Name in foreign languages: The museum is called „Musei Vaticani“ in Italian and „Vatican Museum“ in English. The Sistine Chapel is the „Sistine Chapel“ in English and the „Cappella Sistina“ in Italian. By the way, the name comes from a 15th century pope named Sixtus IV. There’s so much to see. The Vatican Museum is not only the largest museum in the world, but also the best. The absolute top sight in Rome, for us even before the Colosseum and St. Peter’s Basilica. You should plan a lot of time, most visitors stay more than 4 hours in the exhibition. It’s much better to buy your tickets beforehand (see yellow box above), otherwise you’ll probably have to queue for hours. It is even better to book a tour.